View all The Nuts Poker League's venue and regional league tables on the go. TNPL Mobile shows you which venues are nearest to your current location, so no matter where you are you'll always be able to find a Nuts Poker League tournament. 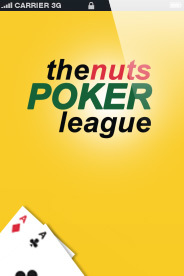 The official Nuts Poker League mobile app and the perfect companion to the official website. Available free for most modern mobile devices, TNPL Mobile is continually updated with exciting new features being added all the time. Please contact us to report any errors, or suggest new features. All fields are required.